PICTON, ON – Barley Days Brewery have just released this year’s edition of a returning seasonal beer, and also have a new beer planned for release in a couple of months. Brewed only in March with locally produced Vader’s maple syrup, this ale has a deep syrup-colour, and a flavour filled with early spring delights. With a bouquet of rich fruity aromas and maple goodness, this savoury beer has a thick, sweet body that is perfectly complemented by the moderately hopped finish. The careful carbonation results in a light and lofty mouth feel and makes every sip you take an inspiring experience. The brewery also has another beer in the works, this one being a new beer with an old name. Loyalist Lager was first brewed by Barley Days several years ago during the initial transition from the brewery’s previous name (Glenora Springs) and ownership, but it was quickly dropped in favour of an all-ale line-up. 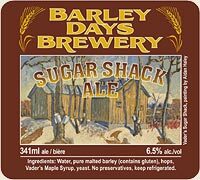 Now the name is returning for a new lager crafted by Barley Days brewmaster Alex Nichols which is currently in the aging tanks, and will be released in time for the Victoria Day weekend in late May. Do you know if it will be at the LCBO or just at the pubs? Not sure, Matt. Try contacting the brewery. Unfortunately they only sell it at the brewery store or at their pub. Won’t be available in bottles (for the takeaway experience) until March 23rd I’m told.